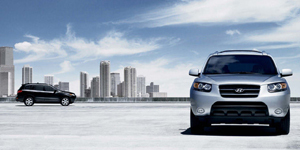 After a thorough redesign for the 2007 model year, the Hyundai Santa Fe receives only few changes for 2008. A 605-watt Infinity Logic 7 audio system is now standard on the top-rung Santa Fe Limited. So is a power sunroof. A new navigation system is optional.